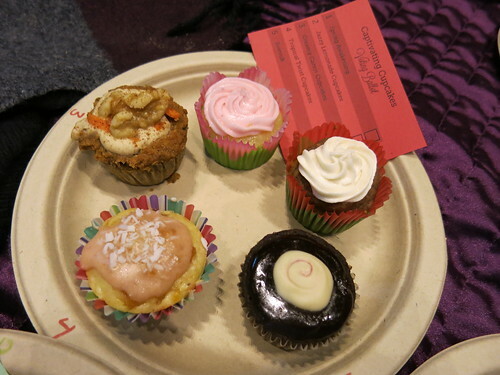 6th Annual Totally Fabulous Vegan Bake Off in Toronto – vegan in your city. 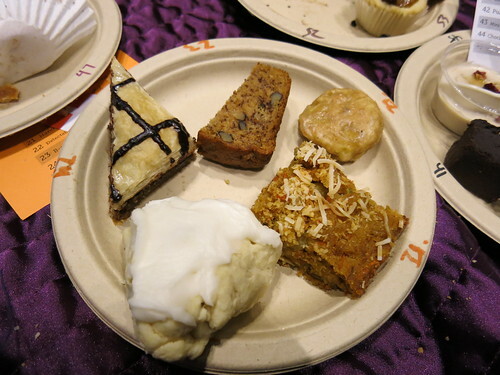 This weekend was the 6th Annual Totally Fabulous Vegan Bake Off, and it was bigger than ever. Every year I go, I have to think about the first one I went to at Harbourfront Community Center (the Third one.) 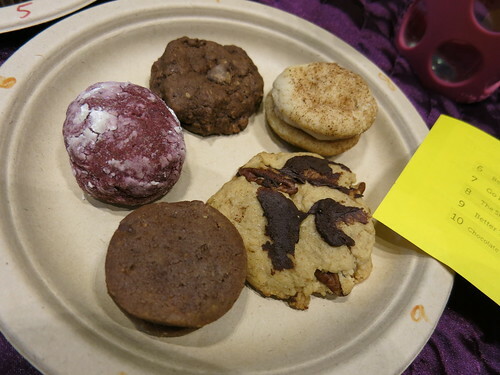 I was so excited, since I had never been to a bake off before, let alone a vegan one at that point. These days, the idea that I only got ONE plate at my first one doesn’t even make sense, but I’ve learned my lesson. 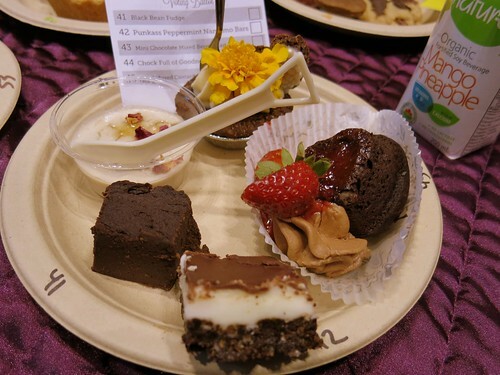 This year, the Totally Fabulous Vegan Bake Off was held at Daniels Spectrum in Regent Park. I liked that it got some of us east of Yonge Street for a few hours, and I really like that it was at a venue that was non-denominational and has actively tried to be accessible to people with varying levels of mobility and socioeconomic status, AND has been a great spot for local social and food justice events, meetings, and activities. In a moment of excellent pre-planning, JC and I brought along a blanket to sit on, and I purchased the maximum tickets allowed as early as possible before we even knew if we could go to the Bake Off or would be in the city. Either way, it’s a fun event, and we knew the money would be going to a good cause. We got to the venue early (we thought) but if there is anything I’ve learned – vegans like bake offs, and at around 1:30 there was already a long line inside. There were a few issues with the lines once things got started up, but I’m sure organizers will learn from it and improvements will happen again next year. 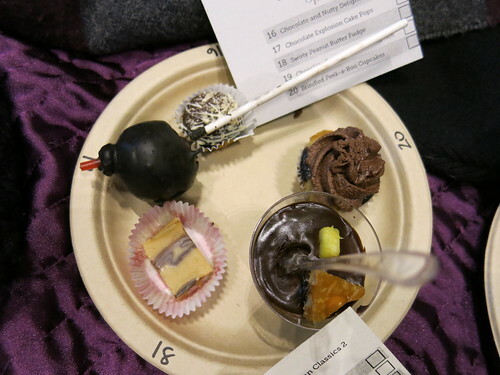 The one thing you notice when you go every year – it just keeps evolving and getting better, and I feel like organizers do care about the experience both attendees and bakers have at the event. 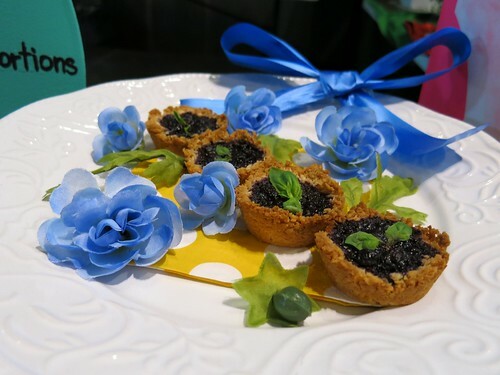 One of my favourite things to do, is to take pictures of all the presentation plates every year, but since my camera is actually still out of commission (as I found out AFTER taking lots of photos at the bakeoff 🙁 ), that didn’t happen much this year. Luckily you can check out a few of the beautiful presentation plates over at The Whole Nicole and this slideshow from BlogTo. 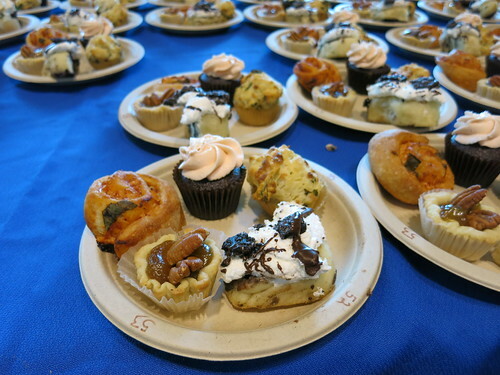 There is also a bake off flickr group full of photos from this year and years gone by! 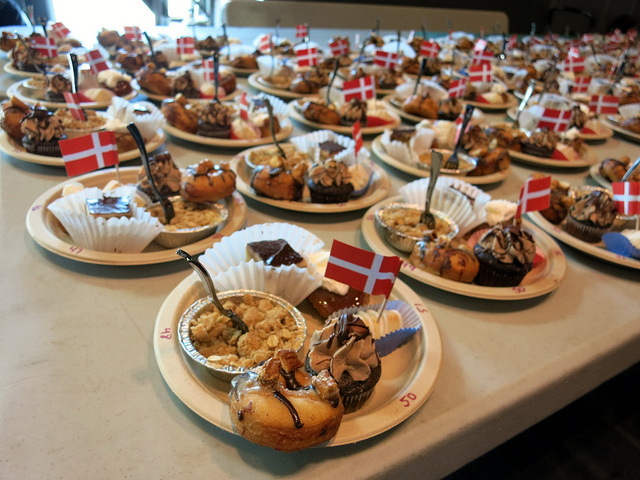 There were so many delicious plates to choose from, in lots of fun categories, but the choice was clear – we started with all 3 of the Pro plates. Sweet n Salty Donut from Through Being Cool Vegan Baking Co.
Black Bean Fudge from Eat What’s Good! Mint Chocolate Mixed Berry Heart Cakes. Winner: The very delicious Snickerdoodle Sandwich Spectacular by Ashley Bratty. Chocolate Chip Cookie Dough Faux-reo! 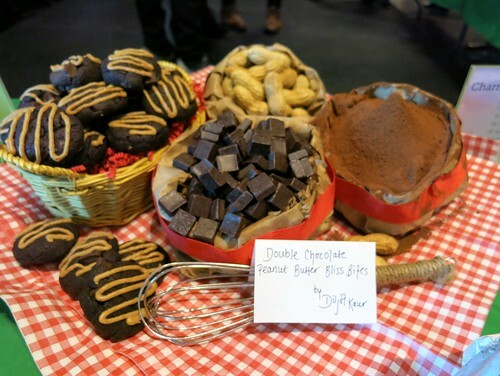 Winner: Swirly Peanut Butter Fudge by Barbi Lazarus. Winner: Choc-LAVA by Reuben & Meloni Jong. This Choc-LAVA was out of this world. B-na-na Bread – Traditional banana bread with apples and walnuts. 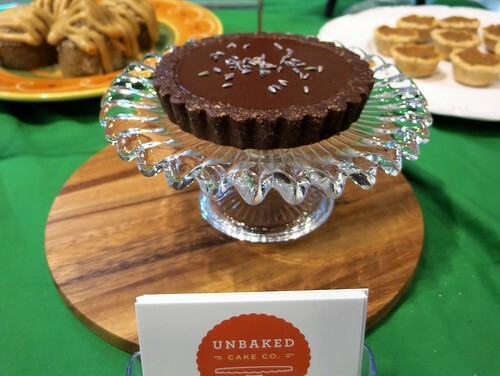 Winner: Raw Lavender Chocolate Cheesecake by Unbaked Cake Co.
Won by Diljot Kaur for Peanut Butter Bliss (she also won the Best Charming Vegan Cookie for Plate 2 – which we didn’t try unfortunately.) It was extremely eye catching, so a very well deserved win. 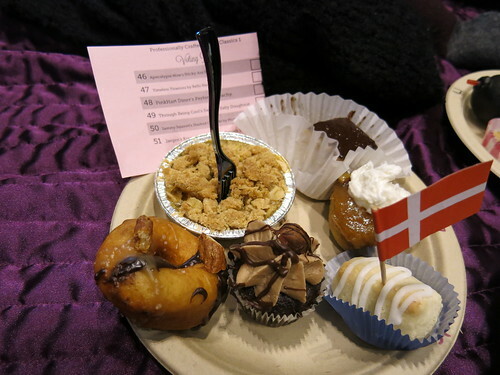 Though I have to say Vegan Danish Bakery & Tori’s Bakeshop had some extremely lovely displays as well. 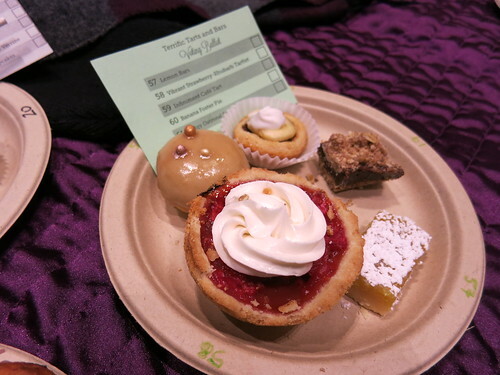 One thing me and a few friends have grumbled about about these events – every year – people seem to bring a long their fur and down filled jackets, and it seems kind of weird to do that at a “vegan bake-off.” On the bright side, this year none of the judges were wearing fur trimmed coats – unlike last year. As a pal so appropriately stated – it’s not a “plant-based bake-off”. So please try and be awesome folks! If you need any more information why wearing fur is not awesome, please check out the excellent work over at the Fur-Bearer Defenders. I’m looking forward to the 7th Annual Totally Fabulous Vegan Bake Off. Maybe a long enough time will have passed by where I think it’s a good idea for me to enter again? Only time will tell. What was your favourite item at the bake off? Apiecalypse now, Tori's Unbaked cake co, Vegan Bake Off. Bookmark.